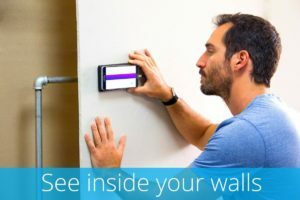 The Walabot Diy Imager will let you see what is hiding behind your walls. Before you start drilling any holes or making cuts with a power saw. When you do any kind of DIY projects, It’s extremely important to know what is behind the drywall. You never really know what the previous owners of a home have done. I honestly believe that the walabot Imager is one of the best gadgets to come along in quite some time. I do most of the improvements in my home and over the years I have found some serious mistakes that previous homeowners have made. Drilling a hole in the wall before you know what is behind the wall can lead to some very big headaches. Drilling a hole in a waterline or possibly even a gas line can ruin your day! Not to mention costing you more money and grief for your project than you ever imagined. Great Tech item for Tech/DIY People. First off, this is a great little product. 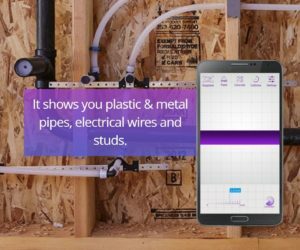 Basically, a premium stud finder that alerts you to pipes and wires in the wall (if you’re just drilling holes). When you are doing work on the house and wondering where electrical and plumbing are going, a full-fledged wall scanner. My experience in stucco walls has been hit or miss, but my house is old and the stucco walls not very flat, so that may have something to do with it. Regular sheetrock, wood, etc. has been great. I even tried this on my floor to see where the water tube was that goes to my fridge, and it found something, but I haven’t climbed under the house to verify! As a stud finder, it works great, as a wire and pipe finder, it works well, but since I try to drill in studs and not in pipes or wires, I can only positively say it found the studs!